Internet regulation in Russia has vigorously expanded in recent years to transform the relatively free communication environment of the 2000s into a heavily regulated one. Our goal was to identify the topic structure of Russian media discourse on Internet regulation and compare it between political and non-political media outlets. We used structural topic modeling on 7,240 texts related to Internet regulation that appeared in the Russian media in 2009–2017. We discovered the non-linear dynamics and the larger share of political media covering Internet regulation over years and compared the topics specific to political and non-political media outlets. We found out that most topics had a different share between political and non-political media and that discourse on law belongs largely to the political media. We also identified four clusters in the topics of media coverage of Internet regulation in Russia related to the law, norms, politics, and business, and the time references of particular topics. In addition, we show the parallel dynamics of the topics on site blockings and political opposition and provide the background on legislation and public opinion on Internet regulation in Russia. 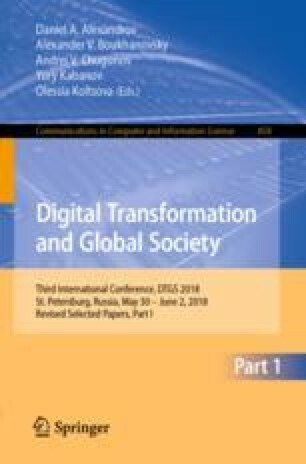 Our results demonstrate a rather politicized nature of Internet regulation and its connection to a broader political context in Russia. A. Shirokanova and O. Silyutina—The authors would like to thank Ilya Musabirov and Stanislav Pozdniakov for their friendly critique and help with obtaining texts. The authors would also like to thank the anonymous referees for valuable comments and suggestions.